How do you generally turn of your Android mobile display? Most probably by reaching out to power button and pressing it. Isn’t a cool if you can turn off your Android mobile by just shaking it? 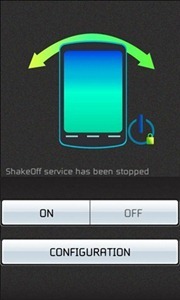 ShakeOff is a free Android app that lets you turn off the display and put it sleep mode by shaking the device. The usage of the application is very simple: install the application, turn on the service and shake your mobile to turn off the display. The application lets you configure sensitivity and auto launch on boot options. You can adjust the sensitivity of the sensors to the desired levels so that application don’t lock for simple shakes that occur when you are travelling or regular handling of the device. Uncheck ShakeOff and select Deactivate > OK. This free application is worth a try if you own an Android device running on Android OS 2.2 or above.